Throughout the first 14 games of DePaul’s (10-5, 2-2 Big East) season, the Blue Demons were searching for a complete game that they controlled for the entire 40 minutes. In game 15, against the No. 24 ranked St. John’s, DePaul finally delivered with undoubtedly their best win of the season on Saturday. The Blue Demons dominated from start to finish, winning 79-71 in the end at Carnesecca Arena. Prior to the game, though, DePaul, received some good news when St. John’s announced that leading scorer Shamorie Ponds would not play due to a lower back injury. Ponds has clearly been St. John’s best player this season, averaging 20.6 points and six assists per game. In conference games, Ponds’ however, averages 23.5 points and six assists per game. When DePaul got news of the injury they had to shift their focus from Ponds to the rest of the St. John’s team who still proved to be a tough out for the Blue Demons. The Blue Demons, for the most part, were able to limit St. John’s from going on any big, momentum shifting runs, they still had to account for LJ Figueroa and Justin Simon who combined for 43 of the team’s 71 points. Coming out of the gate, both teams struggled to score from anywhere on the floor as both defense’s were able to stifle the opposing offense in the first half. St. John’s, who had a height disadvantage against DePaul, was still able to block six shots in the first 20 minutes. 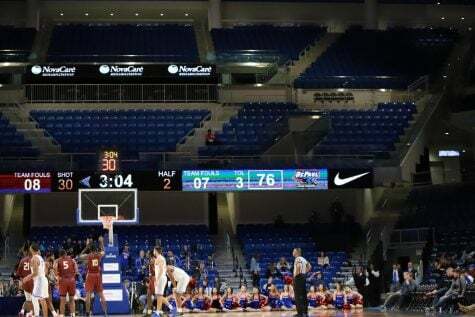 However, after a 15-minute break the Blue Demons came out more prepared and with more energy in the second half, and it showed with them putting up 48 points in the final half. During first half, senior Femi Olujobi was the Blue Demons most effective player, scoring 10 points. Sophomore forward Paul Reed, however, got into early foul trouble and had to sit for most of the first half. He ended up only playing eight minutes and having four points in the first 20 minutes. DePaul and St. John’s both struggled to score in the first 20 minutes, as the Blue Demons held a narrow 31-30 lead with both teams shooting under 40 percent in the first half and combining for 47 rebounds. However, when both Reed and Olujobi came out of the locker room to begin the second half, the two stepped up their game. The pair dominated St. John’s inside combining for 31 points in the half. Every possession down Reed and Olujobi traded opportunities down low, attacking their defenders and getting any shot they wanted inside five feet. Olujobi, who is from New York, was playing in front of 50 friends and family members on Saturday, and looked like he was trying to impress them with his dominant display. Ultimately, Olujobi finished with a season-high 27 points and eight rebounds while Reed recorded his first career double-double with 18 points and 10 rebounds. Sophomore forward Paul Reed shoots over St John’s forward Marvin Clark during DePaul’s 79-71 victory Saturday night. Reed recorded his first career double-double. With the size advantage that Olujobi and Reed had over St. John’s, they were able to punish the Red Storm inside, but also were getting fouled at the same time because St. John’s had such a tough time compensating. Within the first 10 minutes of the second half, the Red Storm had already racked up 10 fouls. The Blue Demons ended up taking 23 free-throws in the half while St. John’s only took three. 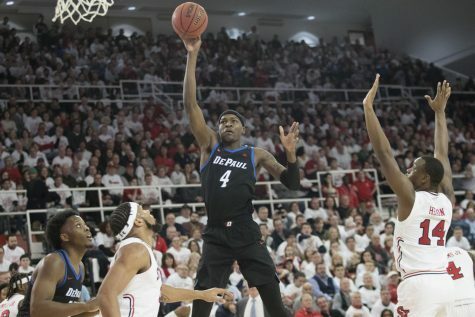 DePaul was able to punish St. John’s on the glass throughout the night — especially on the offensive glass where the Blue Demons had a 14-6 advantage on the night. Reed, Olujobi and senior guard Max Strus combined for 30 of the team’s 40 rebounds. Another key concern coming into the game was whether DePaul would be able to slow down a St. John’s group that entered the game shooting over 40 percent from behind the arc this season, the second-highest in the Big East. The Blue Demons this season has struggled to defend the three-point shot, allowing teams to shoot 35 percent from behind the arc, which ranks 244th in the country. However, without Ponds, who shoots 40 percent from the three-point line, the Blue Demons held the Red Storm to only 26.3 percent. St. John’s was able to stay close late in the game as they went on a run to cut DePaul’s lead to five with a minute to play. But the Blue Demons did a good job of closing out their second straight win in the Big East — something they haven’t done since Jan. 2015. The win over St. John’s gave DePaul their first win over a ranked opponent since Feb. 2, 2016. 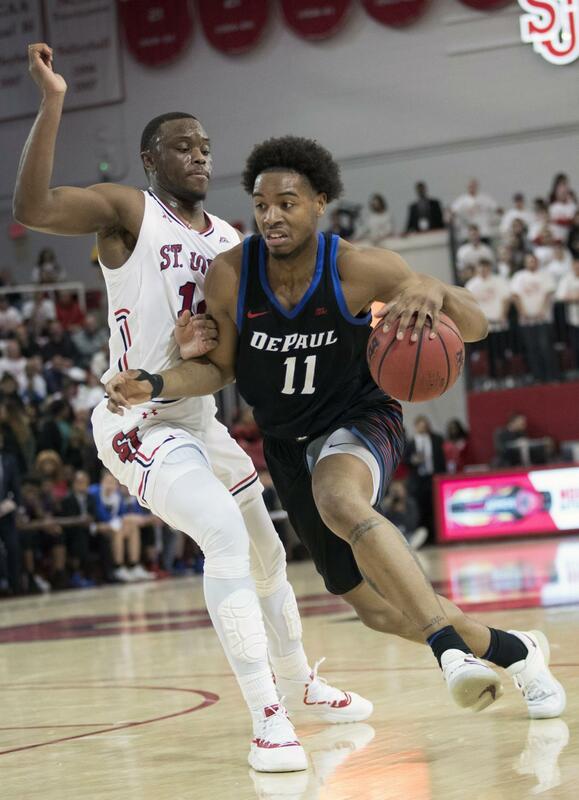 Saturday’s win gave DePaul’s best start in conference play, 2-2, since the 2014-2015 season when they started 3-0, (they ended that season going 6-12 in the Big East.) The Blue Demons are looking for their first winning season overall and in the Big East since 2006-2007, when they finished the season 20-14 and 9-7 in the Big East. DePaul will be back in action on Wednesday to host Butler, where they will look to improve to 11-5 overall and 3-2 in the Big East.